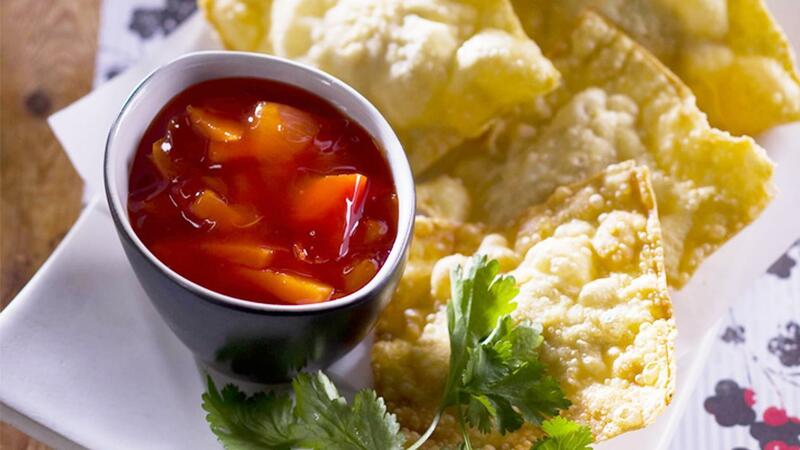 These crispy wontons accompanied by a beautiful fresh herb salad and traditional dipping sauce suits customers looking for a lighter alternative to heavier meals. Combine chicken mince, chopped garlic, ginger, shallots, soy sauce and egg, mix well and set aside. Create an egg wash with the second egg for the pastry. Lay one slice of the wonton pastry on the bench and add one spoon full of chicken mince mix in the centre on the pastry, brush a little of the egg wash and place another sheet of the pastry on top to create a pillow, press down the edges so they are sealed. Toss the coriander, shallots and chilli together. Place the parcels on a large plate and serve with a side of KNORR Chinese Sweet and Sour Sauce GF and salad.